“I scream, you scream ,we all scream for ice-cream” i know its october and iam talking about ice cream! well, it doesn’t have to be always summer for an ice cream right? This is not a 3-ingredient ice-cream or a no-churn ice cream. It does require an ice cream maker and a custard base. Trust me, its worth the time and effort. If you are a coffee addict like me, then this ice cream is for you. If you’re not, then you will become one after tasting it. This recipe is from David lebovitz the perfect scoop. It has an amazing list of ice creams, sorbets etc and this coffee ice-cream has been on my list for a long time and finally took the time to make it. The recipe calls for whole coffee beans unfortunately i dint have any so i used instant coffee and it turned out as good as it should be with coffee beans. But if u had any, please go for it! The Custard base gives the ice-cream a rich creamy texture and Infusing the cream with a good quality coffee powder boosts the flavor of the ice cream. Adding in some roasted chopped almonds enhances the texture of the ice cream to a different level, you’re in ice-cream heaven! Warm the milk, sugar, salt and 1/2cup (125ml) of cream in a medium sauce pan. Once the mixture is warm, stir in the coffee powder until it dissolves, cover, remove from the heat, and let steep at room temperature for 30 minutes. Rewarm the coffee-infused milk mixture. Pour the remaining 1 cup (250 ml) cream into a large bowl and set a mesh strainer on top. In a separate medium bowl, whisk together the egg yolks. Slowly pour the warm coffee mixture into the egg yolks, whisking constantly, then scrape the warmed egg yolks back into the sauce pan. Stir the mixture constantly over medium heat with a heatproof spatula, scraping the bottom as you stir, until the mixture thickens and coats the spatula. Pour the custard through the strainer to extract as much of the coffee flavor as possible, then discard the beans. Mix in the vanilla and the finely ground coffee and stir until cool over an ice bath. During the last few minutes of churning process, add in the chopped toasted almonds. Bake the almonds for 10 to 12 minutes, stirring them once in between. Cool the almonds completely before using them in the recipe. Enjoy Your ice cream over a warm brownie or sandwich it between chocolate chip cookies like i did! Can't believe its been more than an year since my last post. Those of you on FB knows that we recently welcomed the arrival of our daughter to the family. With an grown up and an infant, life has become more busier than ever. I felt very sorry that i had abandant this little space of mine for a very long time. But seriously there was no time to cook or click. Now as the baby is growing, i can have some time of my own. When priya of Priya's Versatile Recipes started an event called Shhh cooking secretly challenge, i used this event as an opportunity to revive this blog. I was paired with Padmajah of Seduce Your Taste Buds for the challenge. The secret ingredient she gave me was basil and chocolate. 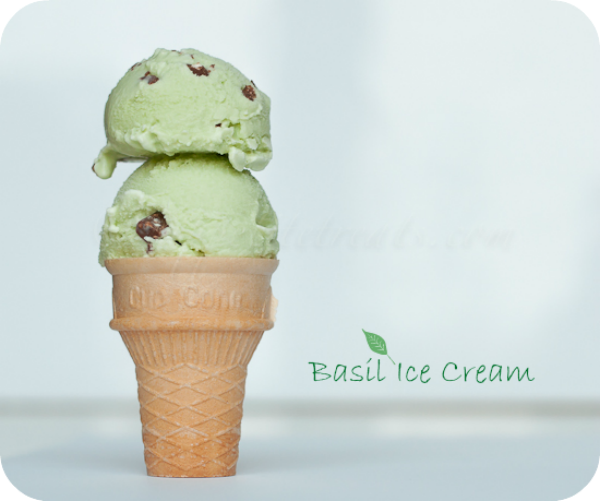 I decided to make a basil ice-cream with some chocolate chunks. Basil has a very strong flavor and using a few leaves goes a long way in the recipe. If you are a basil lover give it a try and you will never be disappointed. In a small pan, combine milk and sugar, bring to a boil over medium heat, stir until sugar dissolves. Transfer to a bowl, cover with plastic wrap and refrigerate. In a small pan, combine cream, and basil, bring to a simmer over medium heat, remove, cover and allow it to steep for at least an hour. Bring a pot of water to a boil. Blanch spinach in boiling water for 30 seconds and then pour into a bowl filled with ice water to stop them from cooking further. Squeeze the excess water from spinach and place it in a blender along with the milk mixture and blend well. Pour the mixture through a strainer and extract the liquid. Also strain steeped cream through the strainer and stir to combine. Cover and freeze the ice-cream mixture in a deep baking dish. Check the mixture after 30 minutes, as it starts to freeze near the edges pull it out of the freezer and using a whisk or a spatula ( i used my blender to beat the mixture ) stir until the frozen bits are broken and mixed up well. Cover and return to the freezer. Check the mixture every 30 minute and beat well as it freezes until the icecream is completely frozen.It will take 2-3 hours to be ready. Add chocolate chunks to the mixture when the ice-cream is almost frozen, stir well to combine. - i used spinach purely to get the green color, you can also use green food coloring . - if you have an icecream machine churn your mixture after letting it cool overnight in the refrigerator. - instead of using chocolate chunks you can also drizzle some melted chocolate over the almost frozen mixture and mix.